The story is set in the aftermath of a long war. A spy from the resistance, a rabbit named Hardin, steals some secret information from a military base of the Regime. This sets in motion a series of events that has effects on both sides of the line. His actions have consequences for everyone, from the highest ranking officers to the smallest orphaned child, including his children. Although this is a tale of spies and war, the real heart of the story lies within Hardin’s children. Being recently orphaned, they must learn to work together to survive this cruel world and learn to overcome their prejudices to do so. 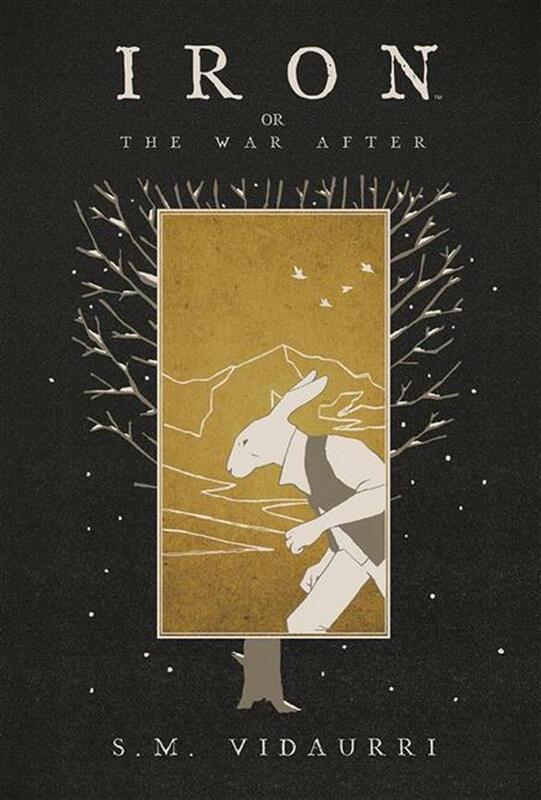 Iron Or The War After is a beautiful book. It’s dark and feels very cold. Using a very minimal color palette, it brings you into this world of constant snow that seems desolate and bleak as far as the eye can see. Every panel is sure to show as little detail as possible, which is fitting. It helps to bring you into the heart of the story and the characters, focusing on what is important. The character designs are great, minimal in design, but with an emphasis on facial expressions and body language. As well as looking great, the story is terrific. It’s gripping and keeps you wondering what is going to happen next. There is just enough exposition to get you caught up, and just enough story to keep moving forward, it’s a fantastic balance. When I first opened Iron, it was hard to determine what kind of story I was in for, and that changed after the first few pages. It’s a story about spies, war and survival. It’s also about taking care of one another, family or not. It’s gripping, suspenseful and worth a read.